Personalized wedding bands are a wonderful way to make the rings as unique as your marriage and the one you love. Customized engraving can be added to the inside and outside of most wedding bands. Personalized messages are a unique way to immortalize your love in a way that will be remembered every day. Custom lettering can include the couple’s names, date of marriage, your sweetheart’s initials or nickname, a spiritual quote, the lyrics to your favorite song or a simple reminder your special bond. According to European tradition, the date and names of the bride and groom would be engraved on their rings as a symbolism of their commitment. In some cases, engraving would turn an engagement ring into a wedding ring after the marriage was finalized. Today, the longstanding tradition of personalized wedding bands and rings has turned into an industry of its own. High-tech engraving equipment makes it possible to quickly etch sentiments in any type of wedding band at a low cost. Personalized wedding rings generally cost the same as comparative non-engraved designs. Depending on the type of metal, an engraved wedding band may cost $30 or $3,000. Intricate detailing and precious stones will add to the cost of any wedding ring. Often the most affordable wedding bands include engraving in the sale price. However, mid-priced rings and luxury wedding bands may be subjected to an engraving surcharge of up to $40 per ring. For couples who need personalized wedding bands on a budget, rings made from stainless steel, sterling silver, titanium, or plated gold usually cost less than $100. Stainless steel wedding bands are one of the most affordable options. Stainless steel resists scratching and readily accepts engraved designs. Wedding bands made from sterling silver are another affordable choice for couples on a budget. Pure silver is a soft metal, so stronger metals are blended in for durability and to prevent tarnishing. Silver wedding rings can be engraved, stamped, or etched with any personalized sentiment. Silver and white metals look especially attractive when the engraved message is stained with black ink for high-visibility. Titanium is another affordable alternative metal used to create durable, long-lasting wedding rings. Titanium is an extremely hard metal, so designs must be performed with a laser engraving machine for the best results. Although engraving in titanium may not appear to be as deep as other metals, the sentiment will be extremely long-lasting and wear-resistant. Black titanium is one of the most popular forms of the metal, but black titanium cannot be engraved. For couples seeking black metal wedding rings or an edgy alternative to the traditional, wedding rings made from black stainless steel can be personalized with engraving. Tungsten carbide has a grayish-black color similar to titanium, however, tungsten is more valuable and it is the most durable metal on earth. Tungsten is so hard it must be engraved with a laser system. Rings made from this metal are hypoallergenic and retain their lustrous polish for many years. Wedding bands made from precious metals are priced based on the value of that commodity. Transition metals, such as platinum, are prized for their sleek, whitish-grey appearance. Platinum is a durable metal that resists tarnish and wear. By weight, platinum is more valuable than pure 24 karat gold. Rings made from this metal retail for $300-$3,000 depending on the cost of platinum, amount of metal in the ring, and if any stones are added. Fortunately, there are more affordable alternatives for brides and grooms seeking the sophisticated look of platinum without the high cost. Platinum-plated silver and titanium rings can be purchased for less than $100. Another rare precious metal belonging to the platinum family is palladium. Palladium is extremely shiny and resists tarnish very well. The metal’s hypoallergenic qualities make it any excellent choice for wedding rings. Palladium used in jewelry has a precious metal content of 95%. Wedding rings made from this material generally retail for $500 or less. White gold is another alternative to traditional yellow gold. Many jewelers offer the same ring designs in yellow gold and white gold color choices. Personalized wedding rings made from 10 karat gold usually cost between $200 and $300. 14 Karat and 18 karat gold rings contain are more pure gold, so they are softer, but also cost more. 18 karat gold wedding rings have the highest gold content. Due to the natural properties of the metal, pure 24 karat gold is too soft for rings designed to last a lifetime and longer. Personalized wedding rings and engraving services are offered by artisan metalworkers, independent jewelers, and fine jewelry chains. Zales offers a line of rings through their online store that are designed to be engraved at no additional cost. 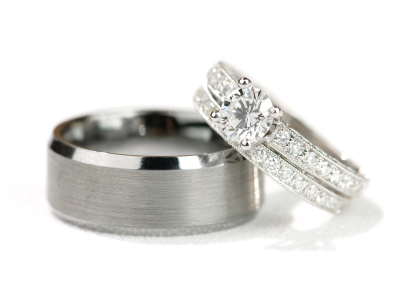 Blue Nile offers a $25 engraving service for all of their wedding rings. Local jewelry stores usually offer engraving services for a small fee. Jewelry stores and artisan jewelry makers will also work with the bride and groom to create one-of-a-kind rings. Jewelry chains offer customization services that allow the couple to choose the metal, band style, finish, and stone setting. Retailers that specialize in engraved items also offer personalized wedding rings and engraving services. Engraving companies will also customize standard wedding rings that were not engraved when they were purchased. Some independent companies offer mail-order engraving services. If you don’t know your ring size, its best to wait until you’re sure the ring fits perfectly before having it engraved. If the ring doesn’t fit perfectly, you can return it or exchange for the correct size, instead of being stuck with a personalized ring that doesn’t fit. Before the industrial revolution, skilled metalworkers and jewelry makers hand carved each ring with a small chisel-like device called a graver. Artisan craftsmen still use these tools to carve letting and engrave designs in metal. Industrialization gave way to new technology in the form of a mechanical engraving machine outfitted with a diamond tipped stylus. Up until the digital-age, all forms of engraving were done on these machines. Machine engravers carve one character at a time usually in block letters, italic script, Hebrew characters, Greek letters, and some symbols. Laser engraving machines have greatly expanded the options for personalizing rings. Laser engraving machines offer a wide range of fonts and styles to fully customize the look of the etched design. Laser engraving is effective on the hardest metals, including tungsten. Depending on the ring style anywhere from 10-25 characters can be accommodated. There’s enough room for 18 to 25 characters to be engraved inside most wedding rings. Before purchasing a personalized ring, it’s a good idea to ask the retailer for samples of engraved products so you know what to expect. Results may vary depending on the engraving process, font, and type of metal used in the ring. Whether you choose affordable wedding bands or the most expensive ring you can afford, personalizing your wedding bands will only increase their meaning and sentimental value. On there face says it all…How do I order a pair?? ?